As usual, the latest installment of the Half-Life series gets my highest recommendations. This one also came with Portal. I was a big fan of Narbacular Drop. More of the idea than the actual game. When I heard Valve snatched up the guys that made it, I knew something wonderful was in the works and I was so right. Portal is what they came up with. Everything about this game was spectacular. The concept, the levels, the computer bad girl, and of course the Weighted Companion Cube. I found a place to print and create your own Weighted Companion Cube. 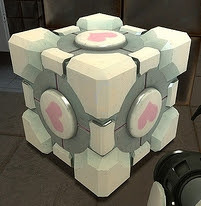 But be cautious, mass of the paper Weighted Companion Cube may not be enough to trigger Aperture Science 1500-Megawatt Super colliding Super Button.